COVINGTON, Ky. -- Valerie McNamara hasn't slept in her own bed since September 2016, when a building collapse left her partially paralyzed and in need of extensive physical rehabilitation. Although the mother and former nurse's mental recovery was quick, allaying fears of serious brain damage, her family learned she would likely need to use a wheelchair for the rest of her life. That need turned out to be incompatible with the house in which they lived . The home that had been comfortable for McNamara before the collapse was largely inaccessible afterward: Narrow hallways, hard-to-reach surfaces and stairs all impeded her ability to continue living as she had before. When her husband, Bryan McNamara, called Sutter Homes to ask if they designed wheelchair-compatible residences, designer and sales director Lynn Sutter was instantly touched by their need. "He told us the story of Valerie and their accident and expressed to Tom (Sutter) and myself how her current home was no longer any place they can live," she said. "She was confined to three rooms in their home. Couldn't get into the laundry room, couldn't cook, couldn't do anything." Sutter knew her company could help. She drew up a floor plan that included enough space for McNamara to move from room to room, a wheelchair-accessible shower, a gym for physical therapy and a variety of appliances that McNamara will be able to use from her chair. Then, she sent a request for donations to all of Sutter Homes' suppliers and contractors. "I do believe that 100 percent of everyone we sent a letter to donated, from the concrete to the steel to the tile to the electricians that gave their labor," she said. 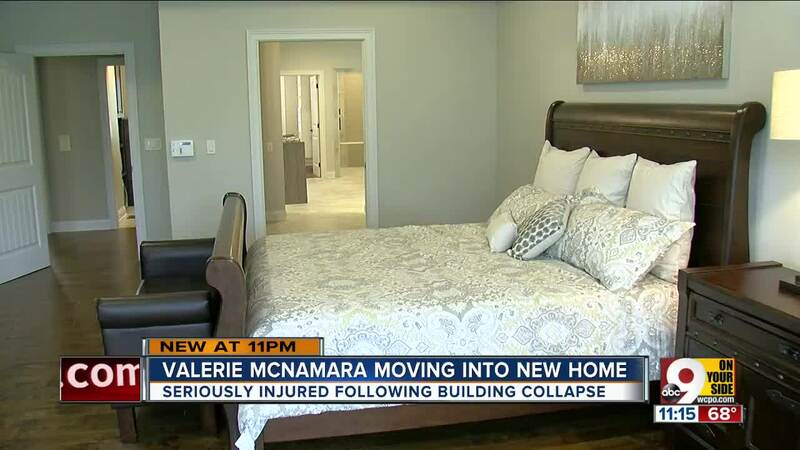 After months of donated labor from more than 50 suppliers and subcontractors in Northern Kentucky, the McNamara family will move into their new home on Monday. The trappings of daily life that many of us take for granted -- things as simple as cooking, cleaning and doing laundry -- will be in Valerie's reach again. "It's independence," Bryan McNamara said when the project was announced. "It's what everyone wants. You just want to take care of yourself."